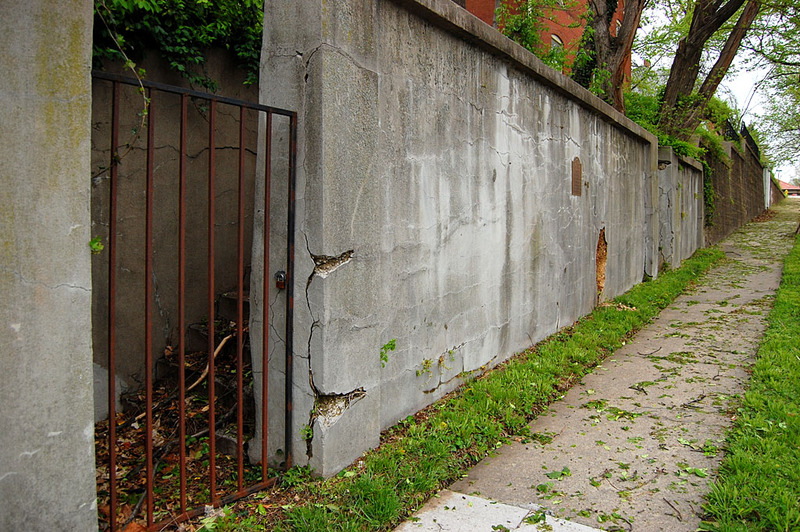 No telling how many hundreds of times I’ve driven past the deteriorating old wall on Lorimier across from what used to be the library without giving it a second glance. For some reason, I pulled into the parking lot south of the old library and noticed what appeared to be two stairways going up to the remains of an old stone foundation. That’s when I saw a bronze historical marker on the wall. That made it worth the walk across the street, even it it was spitting rain. 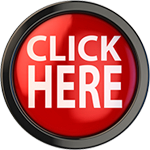 Click on any image to make it larger. 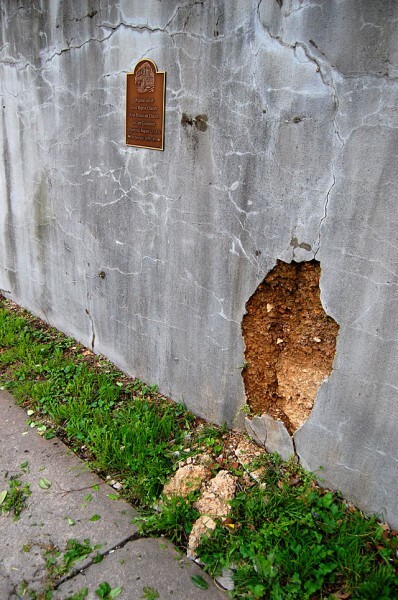 The plaque explained that the ruins were what is left of the First Baptist Church, thought to be the first Protestant church in Cape Girardeau. It was organized August 13, 1834. The site was used from 1839 to 1893. When I did a Google search for First Baptist Church, the fourth reference was a story I did in November 2010 about the new First Baptist Church at Lexington and Cape Rock Drive. THAT story contained a link to photos I had taken of the church on Broadway that was having its steeple painted in 1967. It just goes to show how everything in Cape is related to everything else. 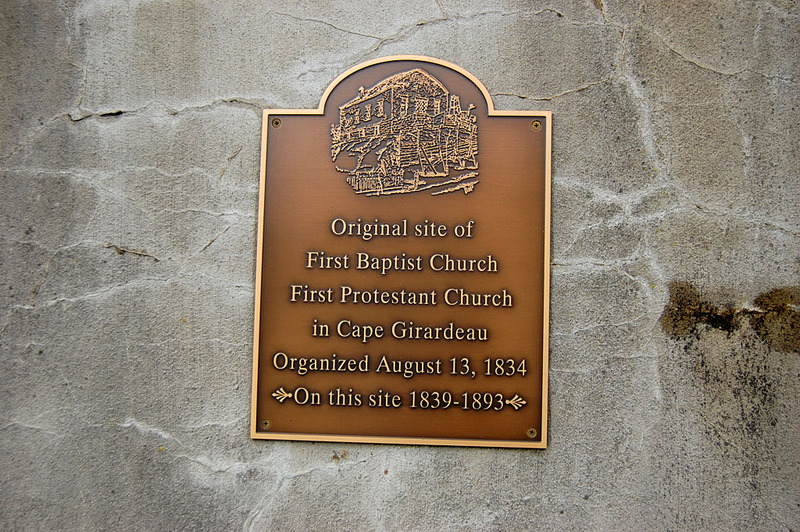 Tom Neumeyer’s book, Cape Girardeau Then & Now, says that the two staircases and two doorways to the church allowed men and women to be segregated as the entered and left the church. Tom relates the tale of the time when the church shook and the floor sank during a Sunday service. Some of the congregants were sure it was the Second Coming. It turned out to be less dramatic: a support resting on a rotting stump simply gave way. Church member Col. G.W. Juden and some of his slaves salvaged a bell for the church from a sunken steamboat. The bell was moved to the church at 200 Broadway in 1893. That church is now for sale. I don’t know if the steamboat bell is still in the steeple or if it was moved to the Lexington church. Is that a duplex residence of some sort on the property now? It appears to have some age. It was wonderful to read again about the beginnings of First Baptist Church which is the church I grew up in while living in Cape. The photos bring great memories. However there is one thing I want to mention. The church I grew up in that was on Broadway is the one on 926 Broadway. That church was sold to SEMO and is now used at the Alumni Center for the university. Have you been inside? All of the statues that were once in what was called Statuary Hall in Academic Hall are now inside the Alumni Center (formerly the sanctuary of our church). After selling to SEMO, First Baptist built a new church on Lexington which you have covered. I think the church on 200 Broadway was General Baptist. First Baptist was Southern Baptist. I shot the 926 Broadway building from the outside this year, but have held off running it until I can go inside to shoot the statuary. There’s an interesting story about how Louis Houck acquired the statues from the St. Louis World’s Fair. In 1947 C R Gibbs lived in the dubplex in this series, with his wife and daughter Phyllis. He worked at Buckner Ragsdale and his wife was, I believe, a principal at May Greene. Phyllis was a good friend of mine when we both attended Lorimier School at that time. The window on the second floor, visible in the photo, was Phyllis’ room where we played paper dolls. You can also see the attic window in this photo. The attic was where we practiced gymnastics on a mat on the floor. The duplex was roomy with high ceilings and pictures lined the walls going upstairs. Mrs. Gibbs was a wonderful cook and often left macaroni and cheese in the oven, on a timer, for Phyllis when she ran home from Lorimier School for lunch. The Gibbs were hospitable people and this old house was grand. Thank you for posting this photo essay. I have climbed those steps many times with my old friend Phyllis Gibbs, but my childhood did not know the amazing history of the steps. Neat story! Someplace in CG there must have been an early African-American Protestant Church. I vaguely remember a black church on Sprigg Street, but this was well before my driving days and so I didn’t get around alot. Does anyone have information on the early black churches of CG? I photographed the national president of the NAACP speaking at the St. James AME Church in 1967. This is very interesting information. 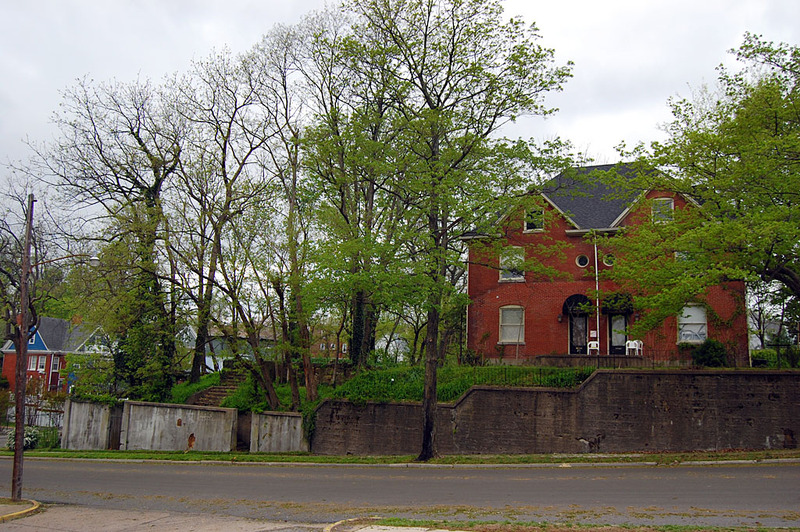 My Jefferson school principal , Lyda B. Gibbs , lived in the big house by the wall on lorimier(not the corner house). She and my mother were friends. In the late 50′s & early 60′s I played countless hours on those stairways while they visited. It was a spooky but thrilling time. Also, hubby and I were married at First General Baptist church at 200 broadway on 8-18-73. I didn’t realize the history of the bell. I did a photo shoot of my granddaughter at the building next to the church a couple months ago. Do u know any history of that building?? The stairway railing and lower walls made great backgrounds. There was an A.M.E. church in Cape. At my reunion at SEMO in Oct., a speaker (can’t remember his name) had some interesting info on the First Baptist Church on Broadway. He said that years ago when they wanted to build the church, the bankers did not think they would be successful so they had to build it so that it could be turned into a theater if they failed. That’s why it has a balcony and why the stained glass windows aren’t not religious in nature. I grew up in the First Baptist Church at 926 Broadway. For some reason I can’t remember what any of the stained glass windows were. Maybe that means my attention didn’t wander from the sermon . . . Maybe. Mr. “Wren” Gibbs began working at Buckner’s before WWI and except for a stint in the Army during that war spent almost 70 years employed there in the men’s department. Other members of the Buckner’s family had similar tenures, Messrs. Boss, Jacobs and Williams come quickly to mind. Such men and women were the strength and weakness of the social contract that REL Lamkin and other Main Street proprietors believed in. Their knowledge of the wants of the old customer base was without equal, but they did not embrace the changing fashions begun in the 60’s with enthusiasm. The house Joy is talking about was supposed to have been built when the Spanish were in Cape. It is supposed to be one of the oldest house in Cape as I recall. There’s an interesting story about how Louis Houck acquired the statues from the St. Louis World’s Fair. So how did they get to Cape???? …Hmmm I bet this will be a good story too! Thanks so much for the picture of the home that I grew up in. 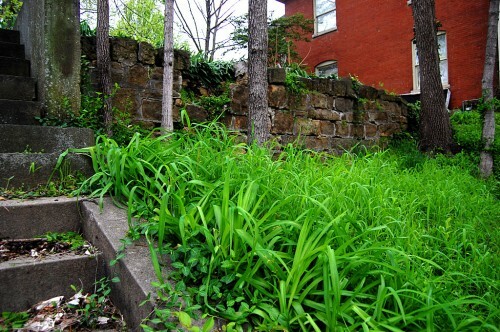 The yard to the south kept growing as the cinders from our coal furnace were scattered in the foundation. My mother (Lyda) was principal at Washington as well as Jefferson, after teaching at May Greens and Lorimier. My father, Ren, did serve overseas in WWII and worked in the men’s department of Buckner-Ragsdale for many years. The store was only three and a half blocks from our home so he walked to and from plus home for lunch most days. Your story reminds me that I would love to see the interior of the home as it is today. What a sweet memory the pictures of the old church property brought to mind.The first six years of my life were spent around the Themis area. Mrs Gibbs and Phyllis were so sweet to my Mom and me. I have no idea about the age diffirence, at the time I thought Phyllis was so much older and so special for taking time to spend with me.I’ve often wondered what happened to Phyllis, and now I know Thanks so much Ken and thanks sooo much Phyllis you made a lasting impresion on me. 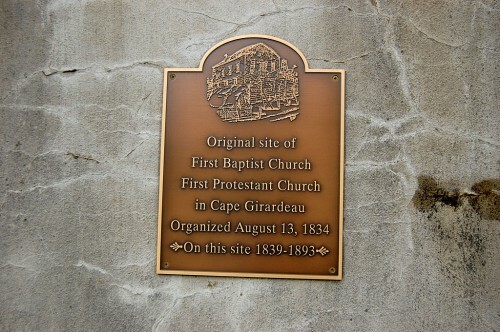 The plaque was placed by First Baptist Church as part of our 175 year anniversary celebration in 2009. The Southeast Missourian covered the unveiling and ceremony. All that remains of that building are some foundation stones and those dual stairs. 200 Broadway was First Baptist before it was sold upon opening of the building at 926 Baptist. FBC actually did not intend to sell the historical bell] but there was a misunderstanding on that point, and the new owners would not relinquish it. One of the stipulations made by the bank when agreeing to the loan for 926 Broadway was, indeed, that the building be designed so that it could be converted to a theater. The balcony even had space for a projection booth, should it ever be needed. An unattributed article, “General Baptist Bell Once Used on Steamboat,” appeared in the Saturday evening edition of the Southeast Missourian on 24 September 1949. I can’t more fully identify the JULIUS, but I can more fully identify the Rev. Maple and his wife. The Rev. J. C. Maple was Joseph Cowgill Maple, who was born in Gurnsey County, Ohio, on 18 November 1833. He was one of 12 children born to William Henry Maple and Sarah (Cowgill) Maple. He died at 344 N. Ellis in Cape Girardeau City on 20 October 1917. The Informant on Rev. Maple’s death certificate was E. H. [Elisha Hall] Gregory Wilson of Cape Girardeau, who also was the attending physician at Rev. Maple’s death. In the “Personal and Statistical Particulars” section of the death certificate, Dr. Wilson reported Rev. Maple’s birthplace as having been near Peoria, Illinois. However, Rev. Maple’s family had moved from Ohio to Peoria County, Illinois, in 1838, when he was four and one-half years old. Dr. Wilson entered “Don’t Know” in the blocks for the name of Rev. Maple’s father and his birthplace, and for the maiden name of Rev. Maple’s mother and her birthplace. The doctor wrote, “Deceased reported these facts to me on numerous occasions. I have forgotten the names of his parents.” Rev. Maple was buried at the New Lorimier Cemetery in Cape Girardeau. Mrs. J. C. Maple was Sarah Ellen (Juden) Maple, the daughter of George Washington Juden, who was born in Baltimore, Maryland, and Ellen McIntosh (Shackleford) Juden, who was born in Kentucky. Sarah Ellen Juden was born in Cape Girardeau on 14 February 1837. She married the Rev. Joseph Maple in Cape Girardeau on 28 September 1858. On 1 January 1861, Rev. and Mrs. Maple opened a Baptist academy in the then unused buildings of the Jackson Academy in the Cape Girardeau County seat. One of their students was Julia L. Lacey, a daughter of Alfred T. Lacey and Hannah Columbia (O’Bannon) Lacey. Like Sarah (Juden) Maple, Julia Lacey’s father had been Mayor of Cape Girardeau City. The academy appears to have closed with the onset of the Civil War. In addition to Cape Girardeau (twice) and Jackson, Rev. Maple was pastor to Baptist congregations in: Owensboro, Daviess County, Kentucky; Kansas City, Jackson County, Missouri; Chillicothe, Livingston County, Missouri; Springfield, Green County, Missouri; Mexico, Audrain County, Missouri; Marshall, Saline County, Missouri; Keokuk, Lee County, Iowa; and Trenton, Grundy County, Missouri. Around 1901, Rev. and Mrs. Maple retired to a farm at Armstrong, Howard County, Missouri. Sarah Maple died there on 27 January 1909. Her remains were taken to Cape Girardeau for burial. She was buried at the New Lorimier Cemetery as well. Rev. Joseph Cowgill Maple and Sarah Ellen (Juden) Maple had no children. After his wife’s death, Rev. Maple moved from Armstrong to Cape Girardeau, where he lived in the household of his wife’s nephew, druggist Joseph Maple Wilson Sr. (1864-1943), the son of Dr. William B. Wilson and Ann Eliza (Juden) Wilson. Joseph Maple Wilson’s death certificate listed his place of death as 344 N. Ellis in Cape Girardeau City, the same as for Rev. Joseph Cowgill Maple. Druggist Joseph Maple Wilson Sr. was Dr. E. H. Gregory Wilson’s paternal uncle, a brother of his father, Dr. Charles G. Wilson Sr. (1854-1890). 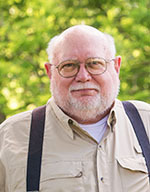 Dr. E. H. Gregory Wilson (b. 24 August 1879, Cape Girardeau), who appears never to have married, died in St. Louis on 12 July 1936. He was Medical Director of Missouri Baptist Hospital at the time of his death. Finally, there’s a great deal of information about Rev. Joseph Cowgill Maple and Sarah Ellen (Juden) Maple in “MEMOIRS Life and Influence of Dr. and Mrs. Joseph Cowgill Maple,” edited by Richard Price Rider and Harvey Eldon Truex (The Hugh Stephens Printing Company, Jefferson City, Missouri, 1920). Google has digitized the book.